If you are planning on attending a wedding in the near future or getting married yourself, I’ll give you one less thing to worry about - your wedding hairstyle! After all, the hairdo can completely make or break your look. Well, what better than to get inspired from the wedding movie of the year - Veere Di Wedding! 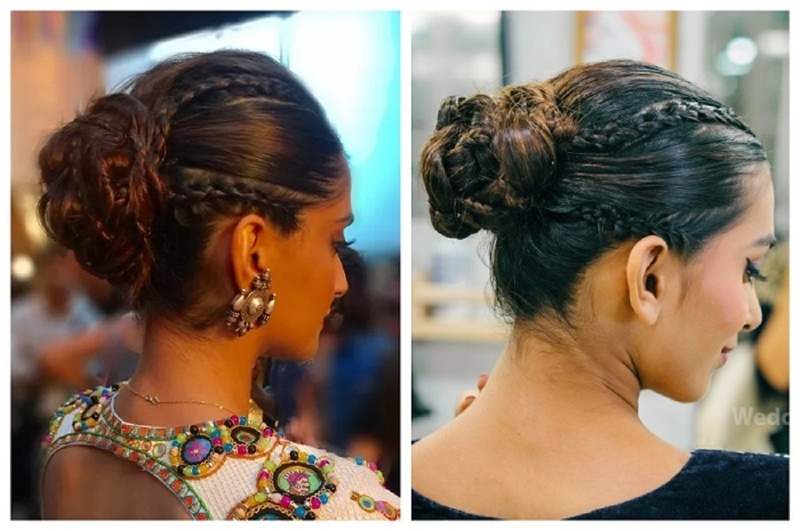 We spotted Sonam Kapoor opting for some really cool bridesmaid hairstyles which literally stole our hearts and so we decided to recreate these hairstyles with one of the top salons in Mumbai - Kromakay! Check out the top 4 wedding hairstyles sported by Sonam Kapoor in VDW and how we recreated them in this video shot by - What Knot Photography. This one's on the list of my favourites as it’s a lazy girl’s hack. It does not take a lot of time to be done and it looks very elegant! 2. Tie it into a neat ponytail. 3. Twist the ponytail into a neat low bun and leave the ends loose. 4. Curl the loose ends for the finishing touch. This hairstyle takes some time to figure out, but lemme tell you the end result will be totally worth it! 1. Tie the hair into a neat ponytail. 2. Wrap a strand of hair on the hair-tie to cover it. 3. Now, do a regular fishtail braid in one portion and secure it with a hair-tie. 4. Repeat the same for another potion too and secure with another band. 5. You can go for one more portion depending on the length of your hair. If you are planning to have all attention on you, then this hairstyle is the way to it. Also, it’ll give your hair a lot of volume. 1. Make a middle partition and curl all the hair evenly in batches. 2. Make a french braid from the front and braid it till you reach the end of the strand. 4. Now take both of them together and twist them in concentric circles, doing the rose style bun. Now coming to my favourite - the cornrow bun. Sonam grabbed eyeballs when she came up with this hairstyle in Bhangra Ta Sajda and this hairdo became a trend setter. So, obviously this makes into the list of top 10 trending hairstyles of 2018 too! 1. Make 4 equidistant partings from the centre of the forehead. 2. In each parting create a 3-strand tight braid - A.K.A the conrow. 3. Tie the remaining hair into a ponytail. 4. Intermingle the cornrows into the ponytail, so that the braids become a part of it. 5. Now, wrap up the ponytail into a bun. So, are you all geared to slay in these wedding hairstyles and have all eyes on you ?